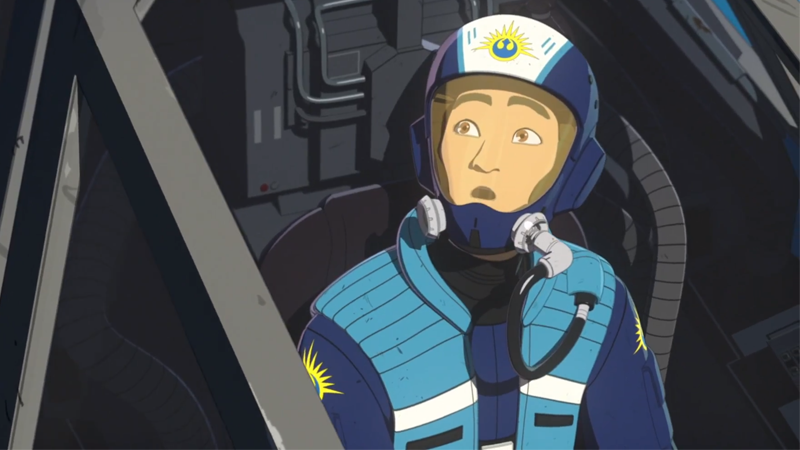 Kazuda Xiono, Star Wars Resistance’s New Republic pilot turned Resistance operative, in the waning days of the New Republic. Although it’s now been years since Disney wiped the canonical Star Wars slate clean, one of its most fascinating periods—the time between the events of Return of the Jedi and The Force Awakens—is still mostly left uncovered. But one section of it in particular is still fascinating: the New Republic itself as an organization. The New Republic—the formal name given to the government system established as a continuation of the democracy seen in Star Wars’ prequel era in the wake of the Empire’s fall—was a fundamental aspect of the post-original-trilogy saga in the old Star Wars expanded universe that the “Disney Canon” that replaced it held over. But the New Republic that we now know in the realm of “official” Star Wars is a very different beast. It is a lot less long-lasting than the New Republic of the expanded universe, and we only really know how it came to be and how it ended—the middle of its existence is still relatively unexplored. What of the in-between? Here’s what we know. The leadership of the Rebel Alliance during its transformation into the New Republic. Although the New Republic wouldn’t be able to really officially get underway for several years, the Alliance formally dissolved and established the New Republic shortly after its decisive victory at Endor, taking out the Emperor, Darth Vader, and the second Death Star in a stunning blow. Although the New Republic was now an entity, it was pretty much still the Rebel Alliance with a new name—planets still had to be liberated from Imperial control and holdouts of the Empire had to be defeated before the New Republic, which had no real formal regions of its own, could actually become the Republic it had christened itself. The process took several months, as Republic forces moved towards Coruscant—the official seat of galactic power for the Empire, even in the wake of the Emperor’s death—as it slowly but surely began adding worlds to its cause, some liberated in battle, some willingly joining, now that retribution from the rapidly-splintering Empire was less of a threat. Even Coruscant itself became a hotbed of civil dispute, as forces loyal to Imperial Vizier (and onetime personal confidant of the Emperor) Mas Amedda battled with citizens looking to join the New Republic. Within a year of victory at Endor, the New Republic took its first significant step toward legitimacy when, after liberating several worlds like Bespin, Akiva, Malastare, and more, the Galactic Senate—dissolved by the Emperor during the events of A New Hope—reformed on Chandrila. That’s the homeworld of Mon Mothma, who was elected the first Chancellor since Palpatine... inheriting with it the emergency powers Palpatine was granted during the outbreak of the Clone Wars decades prior. One of Mon Mothma’s first moves as Chancellor was to give up those powers—part of her pledge in relinquishing her wartime powers included a plan to reduce the current military capacity of the New Republic by 90 percent, entrusting civil defense to the individual member worlds of the New Republic. To Mon Mothma, it was an idea that represented a peace the Rebel Alliance had fought hard to achieve, but it was a decision that would eventually play a part in the New Republic’s unmaking. The Battle of Jakku, as depicted in concept art for Star Wars: Battlefront. Although the New Republic was founded and its Senate reconvened, the Galactic Civil War was still happening—and Mon Mothma couldn’t really demilitarize the Republic while waging a war with what was left of the Empire. Battles continued as world after world entered the Republic’s fold, to the point that eventually the Empire entered peace talks with the New Republic in an attempt to bring the war to an end. Not everyone in the Empire—which had this point basically devolved into various factions controlled by regional governments rather than a cohesive unit—agreed with the talks, however. The first peace talks, taking place nearly two years after the battle of Endor, ended in tragedy when Imperial sleeper agents were awoken to attack gathered Republic Senators and Imperial Moffs on Chandrila, killing several. The crisis threatened to pull the fledgling New Republic apart—the Senate itself was forced to relocate to the planet Nakadia after the attack, several worlds applying for membership pulled out after the attack and threatened to establish a rival independent alliance out of fear the New Republic wouldn’t be able to defend them, and factions within the Imperial remnant hungry for war to continue moved out into the open. Even the New Republic itself was facing internal turmoil; a weary Mon Mothma, who narrowly escaped the Chandrila attack with her life, struggled with trying to present the New Republic as a peaceful alternative to the Empire while also acting on a strong front from a military perspective. These cracks were exploited by crime syndicates and weapons manufacturers as corruption began to infect the newly established Senate. With Mon Mothma needing government approval before military action after the relinquishing of her emergency powers, factions like the Black Sun crime family and the Red Key syndicate bribed and blackmailed multiple senators into consistently voting against any plan for military action against the Empire, effectively stalling the New Republic’s progress and further weakening Mon Mothma’s position as Chancellor. With the Imperials amassing forces for a decisive conflict over the outer rim world of Jakku, the New Republic faced a crisis that threatened to break it entirely—but thanks to the machinations of rebel operatives combating the syndicates blackmailing senators, military action was eventually approved, officially allowing Mon Mothma to send New Republic forces to Jakku. It was over Jakku that the New Republic won the decisive victory it needed to bring the Imperial Remnant back to peace talks. Shortly after the routing of the Imperial fleet, the Galactic Concordance was signed, bringing about the final end of the Galactic Civil War. Under the Concordance, the Imperial Remnant offered a formal surrender, with any holdouts being declared war criminals that could be tried under New Republic jurisdiction. Recruitment of stormtroopers was formally banned, as was production of new forces for the Imperial Navy. While the New Republic was given Coruscant, the Remnant was forced to dissolve its regional governments and form a new internal government that would operate within established galactic boundaries laid out by the New Republic. Several Imperial leaders disagreed, secretly dispatching military forces out into Unknown Regions of the galaxy to hide away from the Empire and New Republic alike—but just five years after the battle of Scarif formally began the Galactic Civil War, the Galactic Concordance brought it to an end. Poster art smearing Leia’s identity as the daughter of Vader created for the novel Bloodlines. What happened after all this in the 25 or so years between Return of the Jedi and Resistance (and The Force Awakens, which occurs just six months after Resistance begins) is still mostly hazy. We know early parts of the New Republic’s rule—like Mon Mothma’s demilitarization pledge being formally voted into law, and the decision not to re-establish the Senate on Coruscant, but to regularly move it around member worlds of the Republic based on regular elections. We also know that the New Republic never reached the size of either the Empire or the Old Republic, heavily relying on trade deals with independent collections of systems to keep the galactic peace, and that after some time, Mon Mothma stepped down as Chancellor, replaced by a string of successors who couldn’t measure up to Mon Mothma’s charisma or popularity among the Senate. But aside from that, there’s decades of time that have mostly been left uncovered by current Star Wars canon. We do know, however, that the Imperial forces that abandoned the Empire after the signing of the Galactic Concordance went on to reform themselves as the First Order out on the far edges of the galaxy, away from the watchful eyes of the New Republic or the Empire itself, which stuck to its word and operated on a similar plan of demilitarization to the Republic. And we know that the First Order eventually willingly defied the the orders of the Galactic Concordance, recruiting stormtroopers and rebuilding its Navy—and that it also began seeding connections within both Imperial and Republic governments to sow discord, distracting either faction from its continuing flagrant defiance of the Galactic Concordance. Two decades after the Concordance was signed, that discord saw the New Republic Senate divided into two political factions which, bafflingly, are named after political ideologies with very different connotations in our world: the Centrists and the Populists. In the world of Star Wars, the Centrists advocated for a stronger military and a rigid, centralized (the name makes some sense at least!) government, while Populists argued for more independence and sovereignty for member worlds of the New Republic. These two factions essentially held the Senate in a perpetual gridlock, voting each other into stalemates that left the New Republic largely incapable of actually defending or working with its member worlds, allowing crime syndicates—many of which were paid by First Order operatives to target New Republic worlds—to wreak havoc across trade routes and hyperspace lanes. One such syndicate, the Amaxine Warriors, was part of a plot to sow further discord in the Senate that eventually publicly exposed Leia Organa—at this a popular senator and part of the populist faction—as the daughter of Darth Vader, rocking the New Republic’s political structure. Leia, disillusioned by the Senate’s infighting and inaction, retired and founded the Resistance as a paramilitary faction that would treat the First Order’s rise as a serious threat to the state of the galaxy. But that wasn’t the only political disaster that spiraled the New Republic into further disarray; the Centrist faction within the Senate, abetted by First Order sympathizers, drafted plans to formally secede from the New Republic, openly joining with the First Order to establish them as galactic power. Chancellor Villecham (left), Resistance agent Kor Sella (middle), and the gathered beings of the New Republic Senate in their final moments, as Starkiller Base fires on the Hosnian system. The New Republic’s downfall wasn’t immediate. There were six years between the founding of the Resistance and Starkiller Base’s attack on the Hosnian system as the galaxy entered a new Cold War period. The Resistance, small as it was, became the de facto opposition of the First Order, while the New Republic refused to take action in an attempt to maintain peace—now openly and aggressively expanding its presence in the galaxy—and because its military was now considerably outmatched thanks to the ongoing affects of demilitarization. What was left of the New Republic defense fleet saw multiple defections to the Resistance—from The Force Awakens’ Poe Dameron to Resistance’s Kaz Xiono—as the Senate was perpetually gridlocked in any attempt to take military action, born out of hubris and a disillusionment about the true scale of the First Order’s military might. Which meant that by the time Starkiller Base atomized the New Republic Defense Fleet and the Hosnian system—the then-current home of the Senate under the New Republic’s final Chancellor, Lanever Villecham—during the events of The Force Awakens, what was being destroyed was really a shadow of the New Republic established just three decades prior. While neither The Force Awakens or The Last Jedi particularly concern themselves with the wider galactic ramifications of the conflicts we see, we know one thing: the New Republic is dead. Long live the New Republic? Time will tell what’s in store for the Star Wars galaxy’s ruling order in the wake of the New Republic’s short and sharp rise and fall—primarily because it’s going to be a long while after the release of Episode IX before Lucasfilm will allow canon material that isn’t films to flesh out this period of Star Wars’ timeline, let alone expand beyond the sequel trilogy to see what factions arise from the ashes of the New Republic. For now, we have to make do with the picture we have of this crucial 30-year period in the galaxy far, far away. And even without further exploration, it’s not exactly a pretty one for the Republic that the Rebel Alliance fought so dearly to restore.